Odo gets all sick and Bashir is baffled. 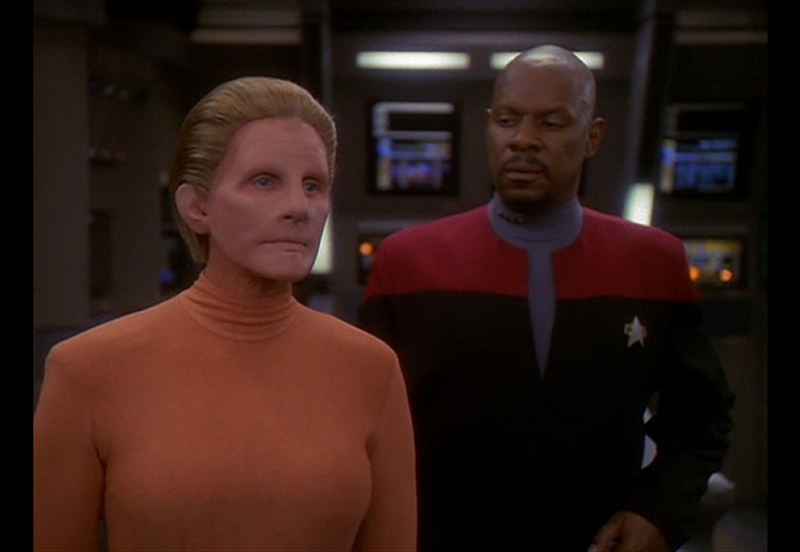 The crew figures that they need to take Odo back to the Founders, and it turns out they actually caused his illness as a way to make him come home and face the music for killing another Changeling (back in “The Adversary”). Sisko takes the Defiant to the Gamma Quadrant and allows the Jem’Hadar to pilot the ship to the Founders’ new, secret homeworld. Odo is in the Great Link for a while and emerges as a human, without the ability to shape shift. 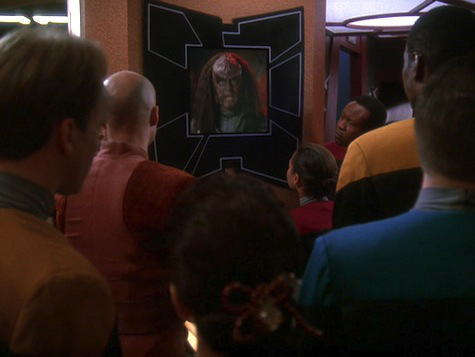 As he begins to struggle with his new existence back on the station at the end of the episode, he sees a transmission of Klingon Chancellor Gowron threatening war with the Federation and tells a shocked Sisko and Kira that he remembers (from his time in the link) that Gowron … is a Changeling. In DS9’s final season, it’s learned that the Founders are dying of a mysterious disease. 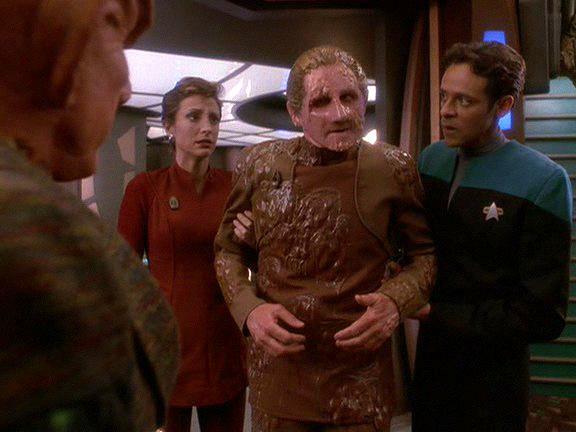 It’s later learned that a rogue Starfleet organization — which we’ll soon meet — infected Odo when he was at Starfleet headquarters in “Homefront”/”Paradise Lost”, and Odo subsequently infected the Founders. Here’s where things get interesting. Odo almost certainly infected the Great Link when he was called to be judged in this episode. He doesn’t interact with any Changelings (that we know of) between “Paradise Lost” and “Broken Link.” He regains his shapeshifting abilities in “The Begotten”, but he doesn’t link with another Founder for at least another year or so. And, by that point, no ships were coming and going from the two quadrants, meaning Odo couldn’t have had the disease and passed it to another Changeling who would have carried it to the Gamma Quadrant. So, really, the only chance Odo had to infect the other Changelings was in “Broken Link”. It’s likely he was infected again, early in the sixth season, when he briefly colludes with the female Changeling (Salome Jens) while the Dominion occupied DS9. Last point on this: The Changeling threat really seems to fade into the background after the middle of the fifth season — even though we’ve been told the Founders have been all over the Alpha Quadrant for years. While it’s never exactly stated, one wonders if those Founders stopped impersonating people because they got infected — and instead reverted to a more typical military campaign. Anyway, the disease is a big key to the Federation winning the war, even if you discount my theory on why the Changeling threat faded away and simply figure that what happened in this episode caused the Founders to get sick and later provided Odo a huge chip to end the war earlier than it would have otherwise. So, sure. Maybe they can make Odo a solid and cause him to start deteriorating from the other side of the galaxy. Why not, I guess? Otherwise, I kind of hate that Garak tries to set up Odo in this beginning of this episode. It’s quite odd that Garak would do this, and that a Bajoran woman would enlist his assistance in her attempt to go after Odo. It’s not appallingly bad. It’s just kind of bizarre. Props to the creators for a bit of continuity. Gowron mentions the Klingons’ claim to the Archanis system, mentioned way back in “Day of the Dove” on TOS. It’s a very small thing, but nods like that make Trek’s history much richer. Otherwise, I really liked the moment between Quark and Odo as Odo walks through the promenade in his sickly state. It’s pretty clear that Quark and Odo are each other’s closest friend on the station (though the Kira/Odo stuff later changes that some) despite their rivalry. And, while I hated the Garak setup stuff, his presence on the Defiant to keep Odo occupied and his interaction with the female Changeling was vintage Garak — as was the classic exchange between Garak and Worf as Garak tries to use the Defiant’s weapons on the Founders’ homeworld. Sisko, Worf, Odo and O’Brien go undercover … as Klingons? It happened, people.